Dr. Carmen M. Simone currently serves as President of Trinidad State Junior College, with campuses in Trinidad and Alamosa, Colorado, a position she has held for five years. Trinidad State is one of thirteen independently accredited institutions within the Colorado Community College System and has the distinction of being the first two-year college founded in Colorado, established in 1925. It is a Hispanic-serving institution, as defined by the United States Department of Education, and has held this distinction for many years. The college serves a primarily under-resourced, first-generation student population with a 55% retention rate and a 45% graduation rate. Dr. Simone has been a peer reviewer with the Higher Learning Commission (HLC) since 2015. She serves as a member of the Commission on Marketing and Communication through the American Association of Community Colleges (AACC) and was elected as a regional representative for the AACC Presidents Academy Executive Committee in 2017. 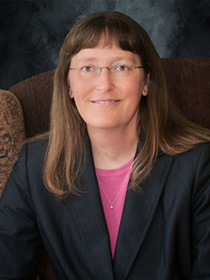 Prior to her presidency with Trinidad State Junior College, Dr. Simone served as Provost and Vice President for Academic Affairs at Lewis-Clark State College in Lewiston, Idaho. She had responsibility for instruction, student services, continuing education and outreach, both at the main campus in Lewiston and at an educational center on the campus of North Idaho College in Coeur d’Alene. While at Lewis-Clark State, she established recruiting offices in southern Idaho to promote institutional recognition throughout the state and attract additional undergraduate students. President Simone began her career at Casper College in Wyoming as a faculty member, while retaining a special summer appointment with Colorado State University as an Assistant Professor. She spent eighteen years in Casper, holding progressively responsible roles including Faculty Senate Chair, Division Chair, and Vice President for Academic Affairs. While in Wyoming, she served as president of the National Council of Instructional Administrators (NCIA), an affiliate council of AACC. Simone holds a BS in Chemistry from the University of North Dakota in Grand Forks, North Dakota and a PhD in Chemistry from Colorado State University in Fort Collins, Colorado.